I have so much to be thankful for this year. First of all, while I was looking under the bed this morning for the pacifier Maddie dropped, I managed to also find the one she REALLY likes, the only one that ever really sends her off to Dreamland and keeps her there for an appreciable amount of time, which has been missing in action for about three months. This discovery could equate to several hours of extra sleep for me, so you can imagine my unmitigated joy when Maddie welcomed it back with the warm affection of a mama bird for the baby who has fallen from the nest. I know, it's the little blessings in life. I may have cried a little. I'm also thankful that my in-laws are awesome, so I don't have to be among the apparent majority of folks who would rather swim naked through a pool of angry wasps than spend time with their spouse's family. I'm extra-grateful that they're taking care of Thanksgiving dinner again this year. I've come to accept the fact that I'll probably never be able to host The Big Day, not in small part due to the fact that I can't even coordinate toast and scrambled eggs to be ready at the same time. My poor family has never experienced the pleasure of a plate of "hot" breakfast (unless Gerry makes it) without either cold bacon, burnt toast, congealed eggs, or some combination of those items. It seems to be no less than culinary wizardry when someone can manage to get 37 Required Traditional Thanksgiving Dishes prepared and on the table without even one thing still being frozen solid or giving everyone food poisoning. Bravo! As if that weren't enough of a reason for me to be grateful for not hosting, I could also never get my house clean enough for Public Viewing in time for any holiday. 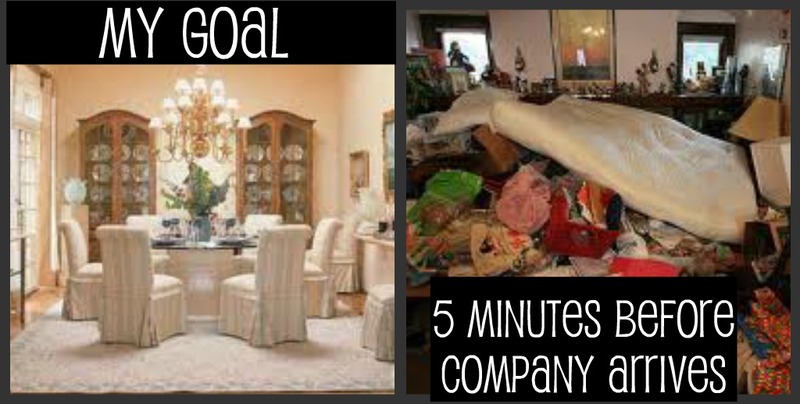 For this I blame my children; we all know there's no point in cleaning ahead of time when there are kids around, because it only takes five minutes for every surface you just scrubbed to be covered in splotches of grape jelly and Polly Pockets accessories. So I wait until the last minute to clean, except inevitably something ELSE comes up at the last minute ("What do you mean we don't have a turkey?!?!?") which prevents said cleaning. I'm also grateful that I won't be observing the post-Thanksgiving holiday/savings event of Black Friday, which starts WAY too early in the morning for my taste and involves extremely close and competitive contact with other humans. Plus, Black Friday is like senior prom for shoppers, and who needs that pressure? Everyone who's going spends the weeks leading up to it asking you if you'll be there, and when you say no their faces cloud over with pity, like you're some sort of societal outcast who has no idea what amazing wonderment you'll be missing. For those who do end up going, there's some kind of insane demand to "succeed" (for prom that usually means Have the Best Time You Ever Had In Your Entire Life - the Black Friday equivalent is to Buy Everything On Your Christmas Shopping List For No Less Than 95% Off). Everyone will be yapping about it as soon as possible at school/work/gymboree, comparing notes on the deals they got, bragging about how much they got accomplished and how many elderly ladies they trampled to get the last XBox 360, until those of us who slept through it will secretly wish we'd gone - for about two seconds, until we realize that there's NO AMOUNT OF SAVINGS that would be worth camping out in front of Walmart at 3 AM alongside the types of people who camp out in front of Walmart. So let's all count our blessings and try to enjoy Thanksgiving, despite the fact that I can already see Christmas trees fully Vegas-ed out in people's front windows (you know who you are), many of us will be forced to sit through a long meal one micrometer away from someone who won't stop talking about tryptophan, and some of you have Black Friday looming before you tomorrow with all of the lost sleep and disappointment promised by a thousand New Years Eve parties. Try not to eat so much that you pass out and miss the only Thanksgiving Day football game worth watching in the history of the NFL. 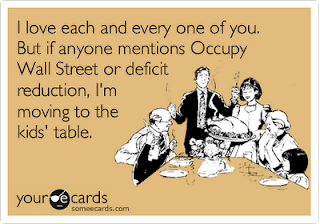 And Happy Thanksgiving, everyone!